A trip to the Yunessun Day Spa was at the top of my "to do" list when DaddyO returned. We heard a lot about it our first tour here but other things were always higher. Now with kids this seemed like the perfect thing to do. It turned out there was something for all of us to enjoy! My biggest question was whether to drive or take the MWR tour. The Yunessun is only 60km away, around an hour and a half drive, and as a family of five going on a bus trip is usually more expensive than going on our own. It's always nicer having the freedom of our own vehicle so we decided to hop in the car and go on a rainy Saturday. It's a pretty easy drive west through Hiratsuka and Odawara. We picked up these cute little corn dogs at a rest area on the way. Maybe not spa food but when there is a keychain with Hello Kitty holding the dog you know they have to be good. It took us about an hour and a half to drive up. The last thirty minutes were spent winding up the mountain on a narrow road with beautiful views. We hoped that the rain would keep many away from the spa but I think the opposite occurred. We parked in the overflow lot ($12) and road a shuttle to the entrance. This is definitely a tourist friendly spot. We checked in and received our bracelets that controlled the lockers and let us charge food. 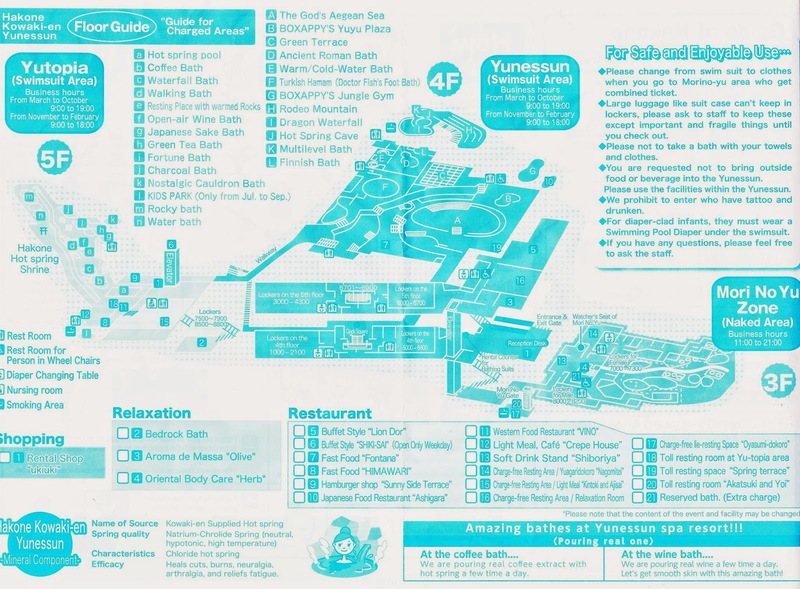 Here is the spa guide and map. We started in the indoor swimming area. I immediately noticed the lack of lifeguards and poolside chairs. The Japanese weren't there to observe but participate and were responsible for their own. One lifeguard keeping an eye on this pool. Impressive. It's hard to tell it from his faces, but CJ loved the swimming. It was Baby B's first time in a pool. There were all sorts of baths. Even one with medicinal fish. Outside you climbed up the mountain and discovered all sorts of baths tucked away. As well as coffee, charcoal and rock baths. All the swimming made us hungry and there were a variety of restaurants to choose from. We had yakisoba for lunch and ramen for dinner. At the end of the day it turned out to cost less to go on our own. The freedom of having our own car and schedule made it immensely worth it. Here is the breakdown of cost. It was a great day excursion and we look forward to going back!